During a recent conversation with another world traveller, we were debating the pros and cons of people migrating across cultures and countries. Travellers to distant places have always done the most in bringing peoples together. Since ancient times, immigrants have helped bridge cultural gaps, foster better understanding and tried bringing their home country and their country of origin closer. Speaking about immigration, the New York Times recently ran an article on Polish immigrants in Britain. Since Poland joined the EU in 2004, an estimated 1.1 million Poles have come to Britain. They are today, after India and Ireland, the third-largest immigrant population in this country. Britain estimates that immigration has added about $12.3 billion to the nation's economy last year. Additionally, East European immigration has reduced inflation pressure by increasing the supply of goods and services. In fact, Poland's improving economy this year is causing a new problem: slowing immigration that could lead to labor shortages in British industry. Today, the reputation of Polish construction workers, nannies and (of course!) plumbers are so high that other East European immigrants say they are Polish to land jobs. Surprisingly and unlike Asian immigrants, the Poles did not restict themselves to the cities, but even moved into remote towns. Read the full NYT article here. 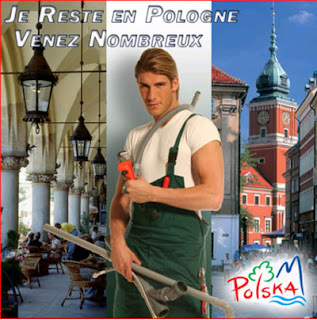 When Britain was opening its doors to Polish immigrants, France used the Polish plumber as a symbol of cheap labor to close its doors during the European Constitution referendum of 2005. Poland recently responded with a tongue-in-cheek tourism ad which shows a Polish plumber saying "I am staying in Poland, do come and visit us"! Very interesting thoughts and observation. There is a lot of Polish working immigrants in Norway too as we are in lack of labors especially in constructing industry. It's funny isn't it that the very diversity we laud and invite actually traces its origins to 'exclusion' over a period of time, strengthening its character over time. With distances shrinking, and with migration as you rightly pointed out, the cultural character of population groupings erodes its distinct identity as in looks, language, traditions, culture, social traits, cuisine, and music among other things. It can only be a loss to humanity, the Walmart-isation of the world. @rennyba: I would expect so given how close your two countries are. @anil p: Absolutely! And you can see some backlash as people begin to resist immigration to keep their cultures intact. We're on the same subject tonight! I still support a word "village" and I'm really comfortable with seeing my culture change because of (thanks to?) immigration. @zhu: I understand what you mean. Paradoxically, we want variety, and therefore would like immigration that allows different cultures to mingle and co-locate ( a world village to use your phrase). However, the long time effect of this will be an homogeneous environment, where there are no more big differences between peoples of different places.